Consumer Package Goods (CPG) companies today struggle to find ways to reduce risk and increase operational efficiencies across facilities within their enterprise, while at the same time trying to find cost effective ways to meet increasing regulatory and trading partner compliance objectives. To that end, these organizations are globalizing their value chain network to support innovation, reach new markets, and reduce costs. However, now companies have less visibility into a product’s lifecycle than ever before, leaving brand owners exposed to higher risk of product issues, consumer health and safety incidents, and shareholder value. 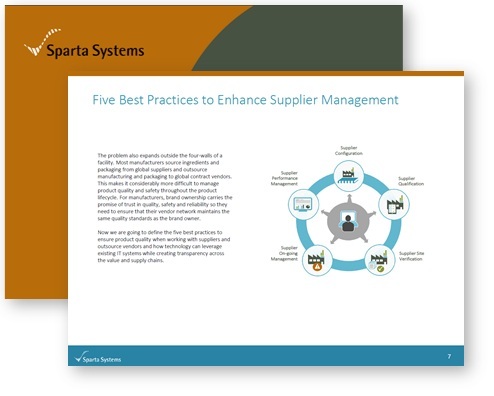 This eBook outlines the five best practices to ensure product quality when working with outsource vendors and contract manufacturers, and how technology can leverage existing IT systems while creating transparency across the value chain.